The Ard Matthews and Friends charity benefit show is now in it's 4th year of running and we're really excited to be carrying on this amazing tradition. 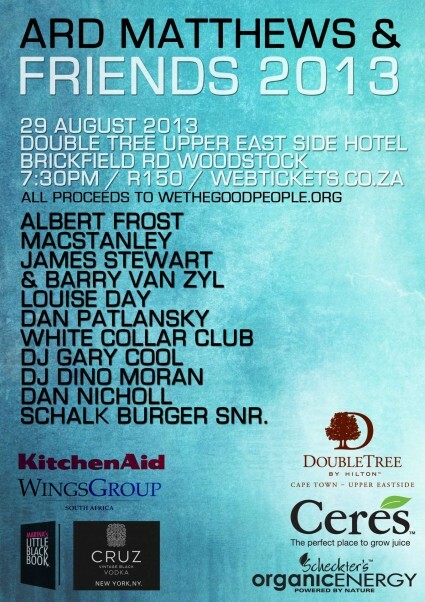 We have partnered up with our longstanding supporters The Double Tree - Upper East Side Hotel in Woodstock to host this event as well as a bunch of really enthusiastic and supportive sponsors. The night will take the form of a chilled out live show by some of the country's top musicians and performers, each doing 3 songs each, with some amazing collaborations in amongst the line-up. Following the live segment of the evening and a very quick and fun auction, our DJ's will be taking us through the rest of the night while we have a party with a clean conscience.